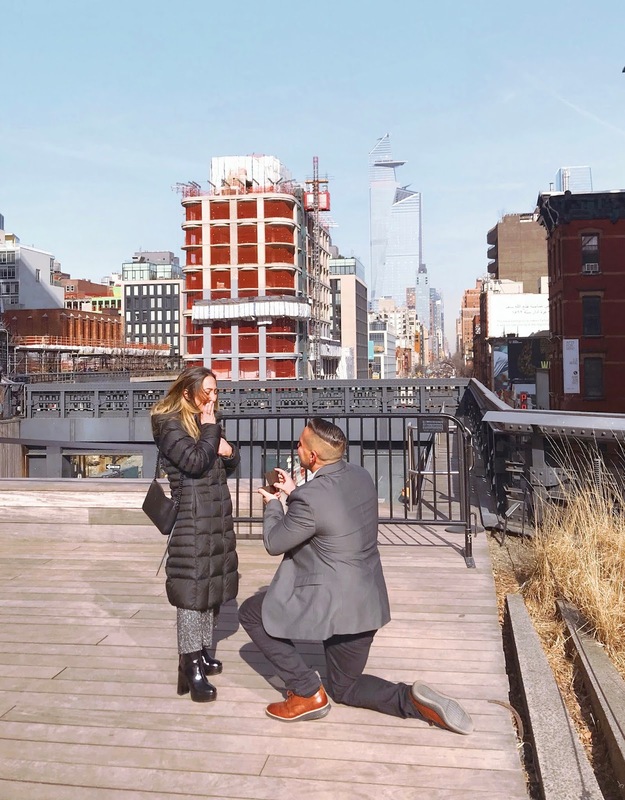 On Saturday, February 2nd, 2019, my best effing friend on earth + life partner got down on one knee and popped the question! Even though Nico and I had spent the last 7 years together, I would be lying if I said I saw this coming — I was in shock beyond belief. Our journey together has forever felt like ‘new love’. I still get butterflies knowing he’ll be home by the time I get home from work, or whenever his name pops up on my phone. He calls me the second he leaves work at night, and we don’t hang up until he parks his car and says “I’ll see you in a minute” – every single day. & it NEVER. GETS. OLD. I'll save you from the sappiness, but I must admit one of my favorite parts about our relationship (which, I promise has been confirmed by plenty of sources): that “third wheel” vibes don’t exist. Nico and I have a ton of mutual friends since we are college sweethearts... and nothing is more comforting than knowing our friends never feel awkward “tagging along the way" with us. And that is exactly how February 2nd went down. Here’s the story: 5 days prior, I planned a last minute brunch in NYC for my birthday. The idea was scrapped together so last minute that I was pretty certain nobody would be able to make it — I didn't even have much of a desire to celebrate my 27th birthday. Contrary to my own belief, I was dead wrong and ended up booking a party of 25 at Temerario in Chelsea, Manhattan. Nico and I planned to take the train into NYC, which runs every hour on Saturdays and Sundays. The brunch reservation was for 1:30PM and Nico suggested that we take an hour-earlier train in so we wouldn’t have to rush. We planned on meeting his sister Nina + her friend at Penn Station, so I had the idea to walk The Highline downtown until we reach the street that brunch was on. It was a brisk 30 degrees, but the sun was shining. Right as we approached our exit off The Highline, there was a nice open area that Nico suggested we take a picture in front of. Nina took a video while her friend snapped the photos, and that’s when I blacked out... Nico whispered in my ear, and asked me to spend the rest of my life with him! He got down on one knee, showed me the most beautiful ring I’ve ever seen, and I pretty much stood there unable to breathe. Before the ring even made it out of the box and onto my finger, I threw myself into his arms and could’ve easily stayed there all day. As I'm sure every girl who has experienced this can agree, it is physically impossible to try to explain the way I felt at that very moment. Overjoyed was an understatement — pure exhilaration lifted me so far away from reality, that I completely forgot the reason why we were in NYC celebrating in the first place! I basically planned my entire engagement + didn't even know it. We were about to surprise 25 of our best friends with the exciting news (w/ the exception of only a few peeps who were in on the secret) and it was PARTY TIME. My engagement ring is a stunning yellow gold split-shank cushion cut customized by SVS Fine Jewelry in Oceanside, NY. Nico started the design process with SVS a month prior, and it was ready for pickup the night before he proposed. He couldn't wait another minute to pull off the proposal he had imagined for a while, and I'm so glad he didn't because it was the most beautiful moment I've ever shared with him. On a more personal level, I hadn't been feeling myself throughout December + January. Just when I felt I was nearing an all-time low, a distant friend of mine from high school, Lara, wrote on my Facebook wall: "The new moon is on your birthday this year. You can literally make anything happen.... and now the sky is like Bee, you want it, you got it. Miss you". &&&&& I cried like a baby. We hadn't spoken in months, and little did she know, this was EXACTLY what I needed to hear. The craziest part? 1 week after sending Lara a lengthy text to thank her for those meaningful words, I became a fiancé. 2 days after the proposal, I turned 27 years old. 2 days after my birthday, I got a job offer and accepted! And last but not least — 1 week after starting my new job, The Beetique was chosen to be a Brand Ambassador for Xyron out of 80 applicants... a huge milestone in the life of a blogger! It has taken me almost 2 months to take a step off cloud 9 to write this post. Not only did I want to authentically tell our engagement story, but I needed time to truly let everything soak in — from starting a new career, landing the opportunity to be a Brand Ambassador for the first time, becoming a fiancé, and all the little things in between. From the bottom of our heart, we want to thank everyone for all the overwhelmingly kind words, wishes, love & support we've received. Nico and I might have 7 years together in the books, but this is just the very first chapter of our journey... and we're stoked! Now, who's down for a destination wedding? !